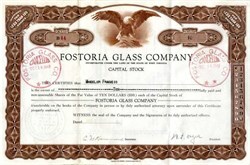 Beautifully engraved scarce Stock Certificate from the famous Fostoria Glass Company issued in 1947. This historic document was printed by the Franklin Lee Division - American Bank note Company and has an ornate border around it with a vignette of an eagle, and has two cancellation stamps on the face which say Fostoria Glass Co. dated October 18, 1949. This item has the hand signatures of the Company's President, W. F. Danzell and Secretary. This is the first time we had offered an issued certificate from this famous glass company. 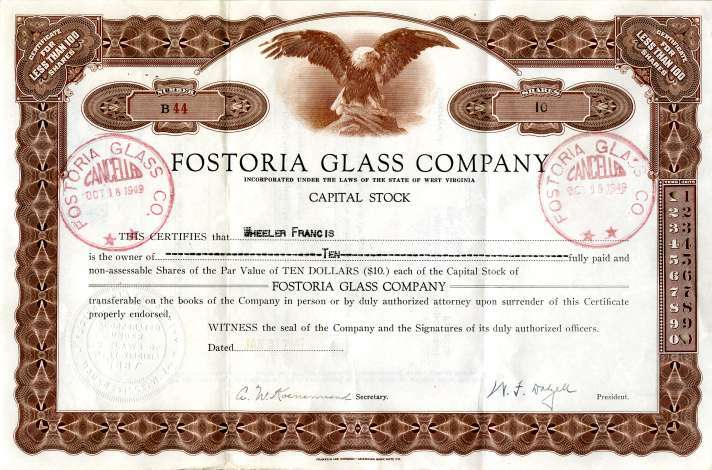 The Fostoria Glass Company began operations in Fostoria Ohio, on December 15,1887 to produce lamps and lamp parts. This site was chosen because natural gas at a recently opened field in the area had been offered at a very low cost to attract new industries. However, the field was so short-lived that in 1891, Fostoria moved to Moundsville, West Virginia, where there was an abundance of gas, coal, and the other needed materials. The company was led by a chemist named W.F. Dalzell, and Fostoria began to produce colored glass tableware and accessories in the mid 1920's. Dalzell became president of the Fostoria company in 1945.